I first became aware of British singer Gemma Hayes when she opened for My Bloody Valentine in Toronto a few years back. It was difficult not to be captivated by her hushed vocal delivery and gauzy elegant shoegazer influence. 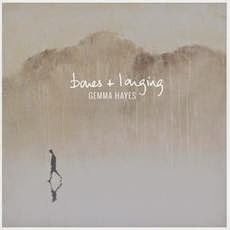 On March 3rd, Hayes will see the North American release of her latest full length album Bone + Longing. Describing Hayes' music easily becomes a challenge to figure out what natural phenomenon to use as an illustration. Tracks like "Laughter" and "Dreamt You Were Fine" are like sunbeams breaking through thick cloud cover. "Iona" is like ripples that move farther and farther from the centre, growing in amplitude along the way. A number of other cuts stand out among the crowd. The melodic refrain of "Palomino" give it a sneaky-catchy quality. A more urgent tempo makes "Chasing" a song to be heeded. A country croon hue is added to the mosaic on "Making My Way Back". An even more gentle side comes through on "Dark Moon". The song wafts as though floating on a breeze. Hayes attempts to have similar effects on "To Be Your Honey" and the minimalist "Caught", but the results are far from engaging. If you haven't heard Hayes' music then you are certainly missing out on an artist who is keeping an under-appreciated style alive.